Orion Nebula. Image: Spitzer Space Telescope. The Orion Nebula (M42, NGC 1976) is the best known diffuse nebula and one of the nearest region to the Sun in which stars are presently being formed. It is visible to the naked eye south of Orion's Belt as a fuzzy patch known as Orion's Sword. Lying at a distance of about 1,450 light-years in the constellation Orion, and measuring about 30 light-years across, the Orion Nebula is ionized and made visible by a small group of O stars and B stars known as the Trapezium cluster. 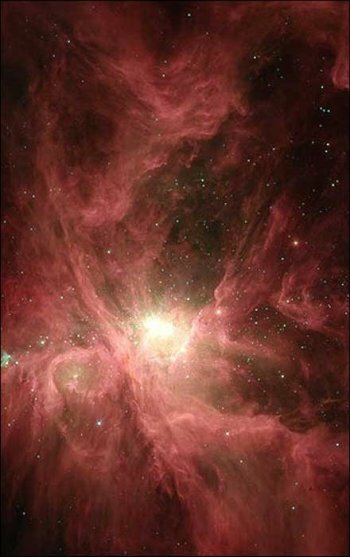 Altogether the Orion Nebula contains about 700 stars, in various stages of formation and development. It is part of a much larger nebula called the Orion Molecular Cloud Complex. A study of the polarization of light in a region of the Orion Nebula has provided a clue to the origin of "handedness" in some of the chemical building blocks of terrestrial life (see chirality). Other studies of the Nebula have revealed the presence of about 150 protoplanetary disks, supporting the view that these objects are common around infant stars.